It’s Furry Friend Friday! 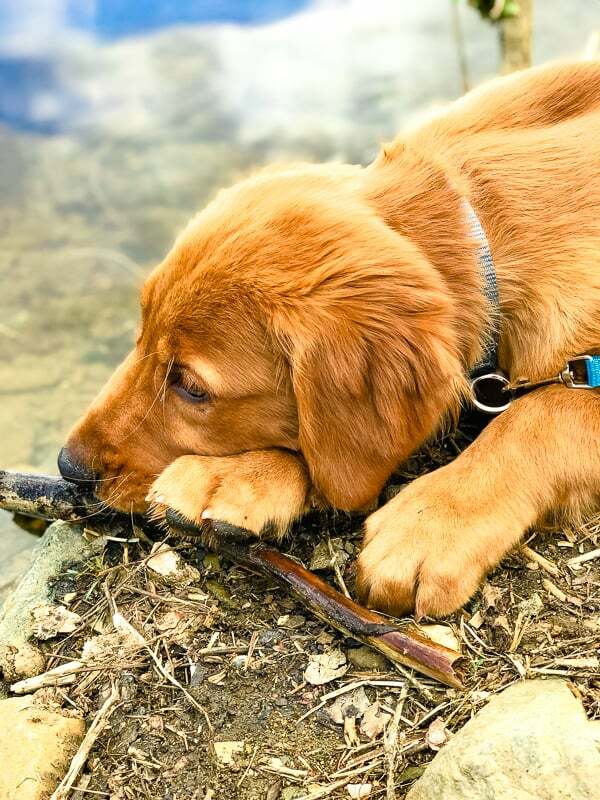 Each Friday I share pictures and updates on Logan, our Golden Retriever puppy. 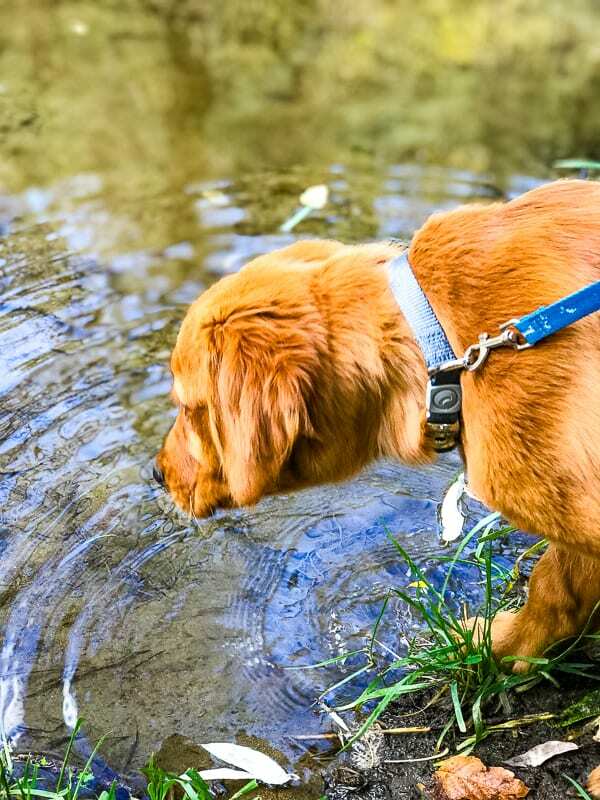 If you love Golden Retrievers, puppies or dogs in general then you’re going to enjoy following his antics each week. He had a REALLY rough day yesterday. Poor guy. In the morning after his walk with dad, he was racing around the living room. Logan will typically come home, eat a bit, torment the cat who’s enjoyed the peace and quiet while he was gone, and then do some laps around the living room. He found out that he’s now just the right height to hurt himself when he runs into the corner of the coffee table. He smacked his right shoulder so hard he started crying and wouldn’t walk. I was thinking we were going to have to have him x-rayed, but with some massaging, lots of love and a bit of rest he’s now as good as ever. Winnie, the cat, who RARELY goes outside because she isn’t allowed to for fear of coyotes and bobcats was in our side yard. She had swiftly escaped at one point when Kurt had let Logan out. I heard Logan barking and figured he was barking at Winnie. so I went outside to bring her in. I picked Winnie up to carry her in and all the way into the house Logan’s jumping up trying to nip at her. We get into the house, he jumps up at her again. 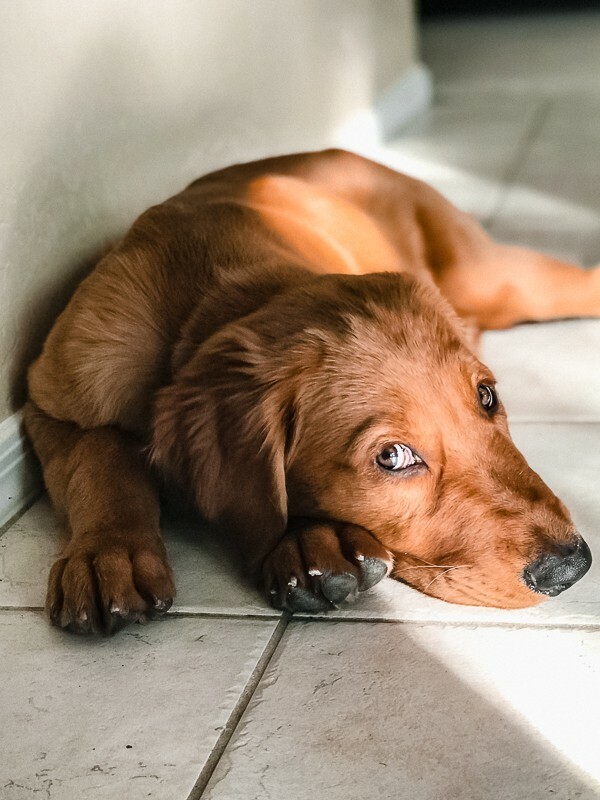 But this time…he falls backward into his full water bowl, making it spill ALL over the floor and making A LOT of noise. Logan’s flailing, and slipping all over the floor. The cat screams because she’s freaked out by the noise then quickly jumps out of my arms. And I just scream because. What a night. Needless to say, my floor is much cleaner since I wiped up all the water and the animals have recovered. Having a puppy is tough work, man. Fortunately, the rest of the week was MUCH better! 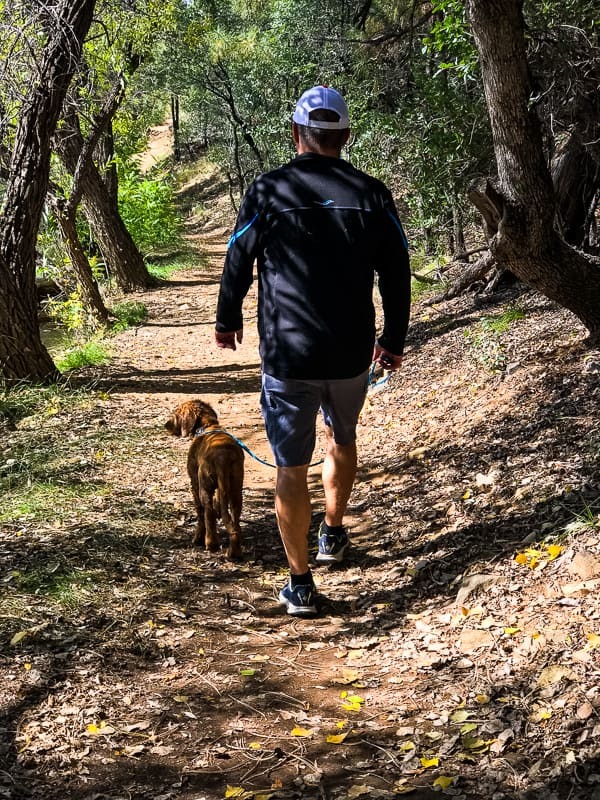 Saturday we took him for his first real hike up to Lynx Lake in Prescott. It was super pretty and the weather was absolutely perfect – sunny and a bit cool. The leaves were changing, too so it finally felt like we were in the midst of Fall. You don’t get that much here in the valley. Logan really loved it. We weren’t sure how he’d react to this new experience, but once he got over his fear of the gently (and I do mean gently because there really hardly were any) lapping waves he was all excited about it. 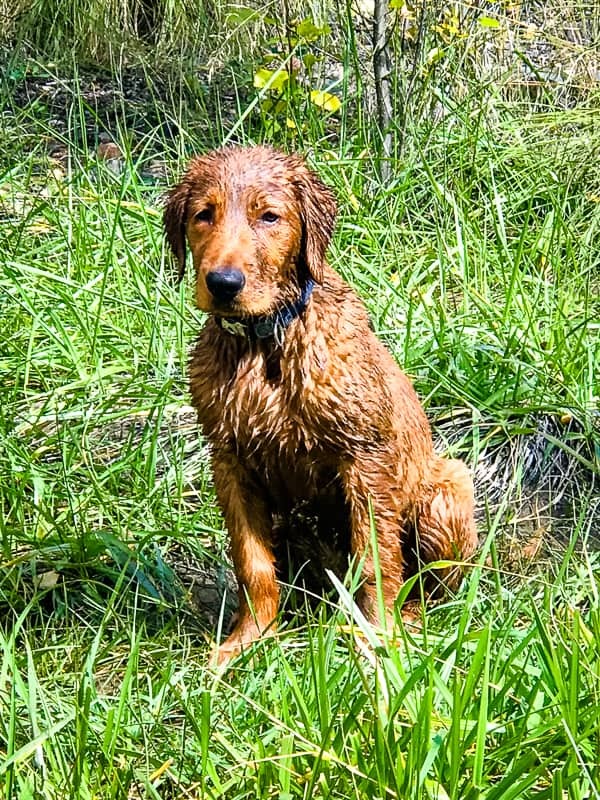 When we arrived at a shallow brook he was running all over the place, really enjoying the water. At one point he went in deeper than he thought he would. It was cute as he went completely under. I posted the video on his Instagram page here. 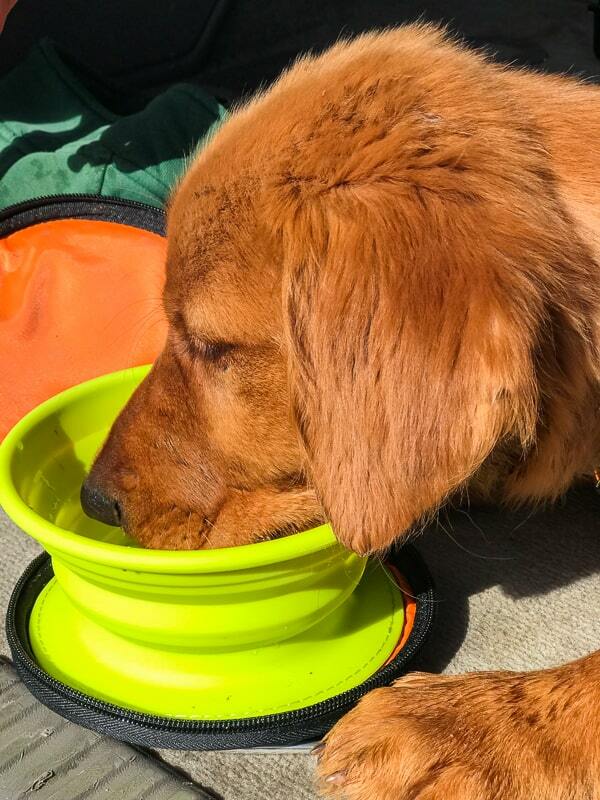 I’d bought him this collapsable drinking/food bowl like this one. It was perfect! I love how it folds down but yet will hold enough water to give him a chance to hydrate. Sunday morning we did our now weekly walk to the local coffee shop. The ladies were very excited to see him again and he was happy to receive the attention. 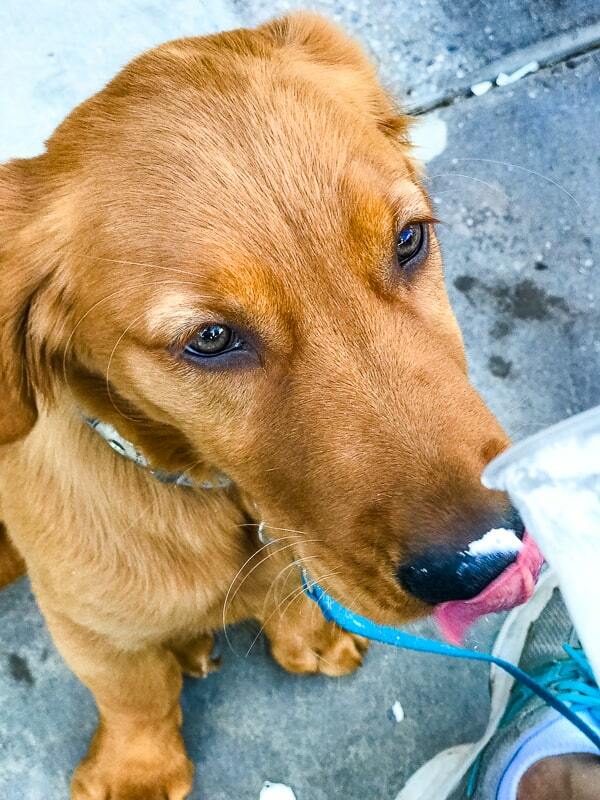 He was given his puppaccino and LOVED it! 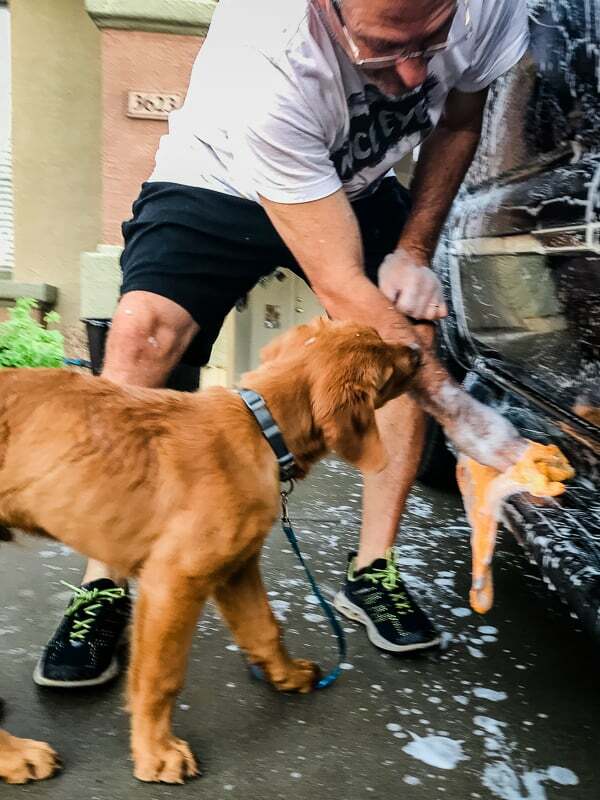 Then later in the afternoon, he “helped” dad wash the car. He loved when Kurt squirted him with the hose and was doing a good job supervising. He’s still thinking he’s a lap dog and loves his morning time with me. He’s eating LOTS and growing quickly! He’s also become tall enough where he can jump up on the couch which is something I’m not happy about. I do not want him up there. Then tonight while Kurt was watching the game and had him up on the couch (grrrr) he WALKED from the couch ACROSS the coffee table to the other couch where the cat was. Logan is so cute! I love his color too! I’ve had Golden Retrievers since my youngest was 3 years old. My children have wonderful memories of growing up with these fun, smart, loving dogs! 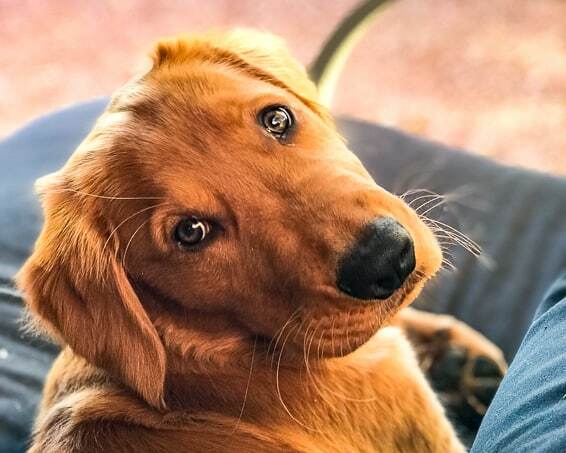 I would never want to be with out a Golden in my home. I will be enjoying your posts about Logan! They are the best, aren’t they, Marcia? Thank you so much for reading. I look forward to bringing you much more of his antics!